From the moment Glenn Miller walks onto the stage the audience gets the feeling of mysticism. The audience quiets down and listens to each word he utters. Before you know it he has 20 volunteers from the audience on stage anxiously awaiting the opportunity to be hypnotized. His experience as a seasoned performer takes these individuals to places and actions that they would never do under ordinary circumstances. Their demonstration of antics that Glenn puts them through has the audience in hysterics. It's all fun. It's all in good taste. The audience members who participate are the "Stars of the Show." The "Stars of the Show" will slowly drift into a hypnotic sleep. When they awaken they will never believe their friends when they are told that they danced like Irish River Dancers or they walked around like models from Victoria's Secret. When the most reserved man gets up and portrays Michael Jackson or a Sumo Wrestler he will think his friends are fibbing. Yes, all this fun and more are yours when you engage Glenn Miller, The Master of Comedy Hypnosis for your next event. 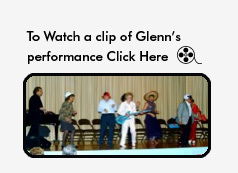 Click the "buttons" to the left of your screen and watch as they come alive and show you some of the audiences that have enjoyed a fabulous time being Hypnotized by Glenn Miller. GLENN MILLER, THE CLINICAL HYPNOTIST. Glenn Miller is a Certified member of the National Guild of Hypnotists. His private practice includes "one on one" sessions with people who need his assistance with regard to Weight Loss, Stop Smoking, Stress, Insomnia, Fear of Flying, etc. Click the categories below and see for yourself the educational information on these subjects as well as the opportunity for you to purchase Mr. Miller's CD's on any one of these subjects.